We always make at least one trip to the beach every summer. Steve and I aren't big beach people as evidenced by my blindingly white legs, but once or twice is fine. 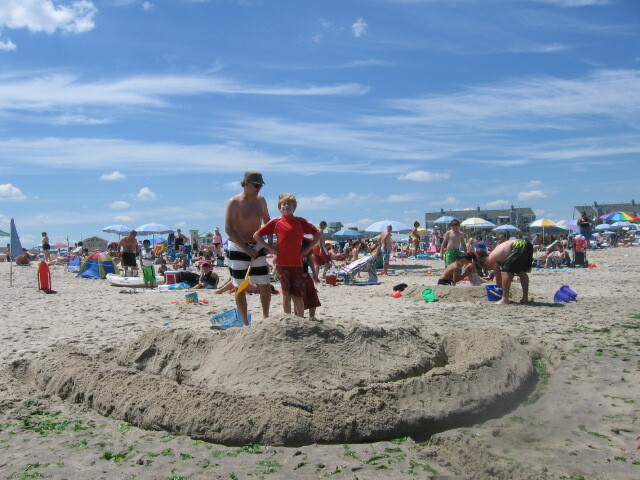 This was one of the first sunny weekends that we've had all summer, so we packed up and headed down the shore. I've blogged about past shore trips before: here and here. But this one was different. It was easier. We didn't have to work around anyone's nap time. Nobody was making kamikaze dashes towards the water. Both boys mostly understand the concept "mortal danger" now, which is a good thing. Everybody's attention span was long enough for prolonged digging in the sand. Steve and I were actually able to sit and read for a little bit. We were unprepared for this leisure and hadn't brought enough chairs. It took us a while to get to this point. I don't have to brace myself anymore for the worst possible scenario and remain on guard against random missteps or meltdowns. I think we have to savor this moment in parenting, because soon we're going to have to deal with teenage angst.